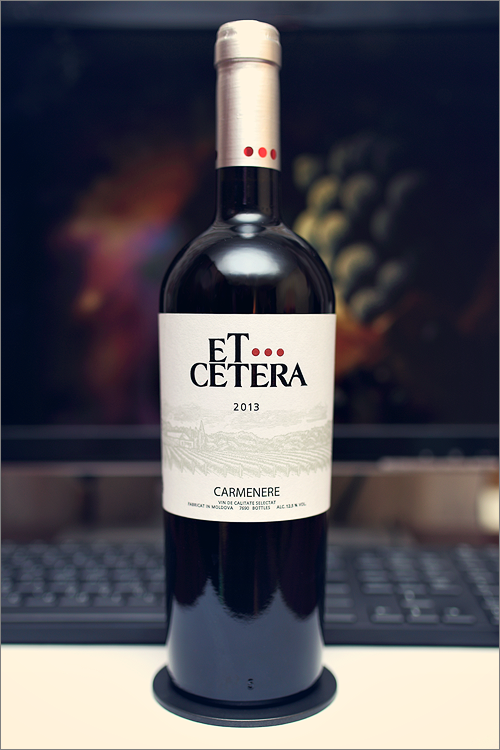 We continue to review Wine of Moldova and this time we’ve decided to bring out something rare and quite special – Carménère 2013 from Et Cetera. There are only a few winemakers in Moldova who do grow carmenère grapes and even fewer have the courage to produce single varietal carmenère wines. Carmenère is known as ‘the lost grape of Bordeaux’ and is rejuvenated in Chile as the nation’s main grape variety with great success over the last decade – it’s a kind of modern Cinderella story. The wine has a clear garnet color, it is transparent and quite deep, with the rim-color of a bright crimson shade. The nose is rich and insistent, with no signs of wine faults. The main flavors on the first nose are those of red fruits mixed with elegant savory notes: wildberry, redcurrant, rose hips, sour cherry, cherry tomato, red mirabelle, wormwood and cherry tree sap. Later on, come noble-savory flavors of red bell peeper, oakwood, and black tea. The wine is dry and lean, tending to be sweet in the mouth, but with no signs of residual sugar. It has moderate alcohol level, high acidity and and medium, round tannin, which makes the wine taste a bit green, savory and delicious. The wine has a fair overall balance, it feels lean, a bit wide and quite crisp. This is a medium-bodied, velvety wine with a clear savory profile. The wine has a medium finish and a balanced, velvety-smooth aftertaste. It is crisp and green towards the end, and it leaves a quite pleasing feeling. This is definitely a fine Wine of Moldova and the overall rating says the same, with 89.5 points scored it is right there, among the best wines we’ve tasted so far. Please click on the chart icon on the left in order to get to the wine rating page, where you can find all the wines we’ve tasted to date. Last but not least, it is to be mentioned that the previous vintage of this same wine has been a revelation, while this one is even better. As a matter of fact, carmenère wines are very little known outside of France and Chile, which speaks for itself in regard to winemakers in Moldova, who do grow carmenère grapes. To be honest, we do believe that carmenère wines have a bright future ahead, and if you doubt it, just try one yourself – they’re different and they’re delicious.